8 Comments Published by Terrace Crawford on 9/30/10 at 11:00 AM. 4 Comments Published by Terrace Crawford on 9/24/10 at 3:27 PM. Ok -- so I'm single. I'll put that out there. One of the things I don't like about being single is that you have people playing matchmaker with you. Some have suggested I try internet dating sites. You know, eHarmony... Match.com... and so forth. Even though I know a few people (personally) that these have worked well for, I'm just not so sure its for me. 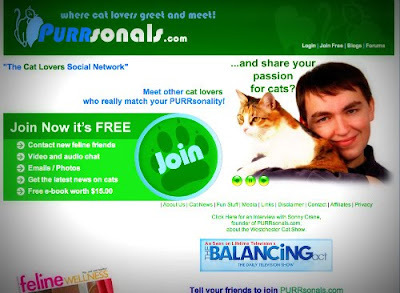 Purrsonals - a site where you can meet and greet other cat lovers. I'm known for my sparkling personality... not my purrsonality. 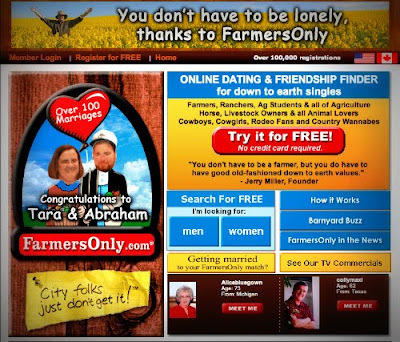 Farmers Only - I may have grown up in farmer's territory, but I don't care to date one. Shoot, I don't even play Farmville on Facebook. ... and last, but not least, Women Behind Bars - a great place to connect with those incarcerated. 0 Comments Published by Terrace Crawford on 9/18/10 at 6:23 AM. People you love are headed to Hell. 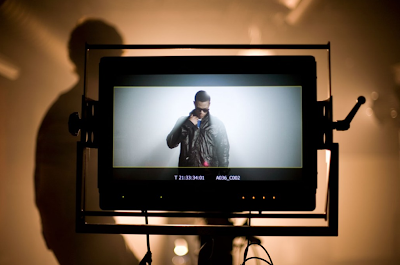 Care enough to watch this video? My good friend, Tony Nolan, shows you how simple it is to share your faith with your friends. Win a Free Leader Kit from Catalyst! 28 Comments Published by Terrace Crawford on 9/15/10 at 11:35 AM. I'm partnering with Catalyst to bring another Tweet-to-Win contest to you! This time around we're giving away an impressive leader kit, complete with books, music and the entire CD collection from the Catalyst Conference in 2009! That is hundreds of dollars of resources... just by sending one tweet (or more if you like us =)! - The entire CD collection from Catalyst 2009! 3. At 3PM (EST), this Friday, September 17th we will choose 1 random winner from the comments & email you! 0 Comments Published by Terrace Crawford on 9/14/10 at 9:49 AM. Awesome video... and so true! 0 Comments Published by Terrace Crawford on 9/10/10 at 2:04 PM. Not on Twitter? Create an account quick like! We've got another TWEET TO WIN contest coming at ya on TUESDAY. 0 Comments Published by Terrace Crawford on 9/8/10 at 11:01 AM. You may have heard about Simply's LIVE Curriculum but maybe ... just maybe... you've had some questions about it. I know I had some questions at first glance. Jeremy Zach and I caught up with Matt McCage (the curriculum publisher genius) and asked him to tell us more about this new small group resource. Why Should I Use LIVE Curriculum? For me it's all about planning and credibility. Knowing that I can personally have a 2-year plan in place that I can prayerfully customize frees my mind to be more relational and less administrative. Knowing I can then present that plan to my senior leadership, parents and workers shows I have placed the necessary thought and prayer in the execution of a plan that helps change the lives of students we are ministering to together. What are some of the main features in LIVE Curriculum? What is the strategy behind the curriculum? The Junior High Live Curriculum is a 2 year scope and sequence aimed at developing a Junior High student who is rooted in the truth of God's Word with an understanding of how it relates to their life today. You say its "customizable." How so? Each lesson can be edited within the LIVE engine. This means that a leader can add or delete sections of the material, rephrase or reposition the material to fit their ministry's DNA. The Administrator can then choose to keep the edits for themselves or "publish" the edits for their entire team. If the leader feels more comfortable, they can download the entire lesson and make their edits in Microsoft Word. How is technology utilized in LIVE Curriculum? The LIVE engine is designed to help the leader communicate with their team through the dashboard and allows the leader the ability to customize each lesson. Within the "myFiles" section the leader can upload various files that would help streamline their administration needs. Also, with SimplyTXT integration, a leader can send out a text message directly from the site. Win a FREE Ticket to Catalyst One Day! 20 Comments Published by Terrace Crawford on 9/7/10 at 9:41 AM. CONGRATS TO @ROBSHEP & @YPMHAMMER I'm giving away 2 FREE TICKETS to Catalyst One Day - Central Virginia right here! Catalyst One Day is a one day conference focused on the Keys to Momentum. Two of the Church's top leaders today will be teaching you principles for creating and sustaining organizational and spiritual momentum. 3. At 5PM (EST), this Friday, September 10th we will choose 2 random winners (1 ticket each) from the comments below & email you. If you don't win, HURRY and get the best possible price on tickets by calling 888.334.6569. Thanks, hope to see you in Central Virginia! 0 Comments Published by Terrace Crawford on 9/6/10 at 8:53 PM. Enjoyed a nice weekend - including a half-day of solitude (which I don't get very often). We were preparing for Earl. Remember him? ... and so I did. Weather turned out to be beautiful! With ZERO precipitation. Unfortunately I had lots of Labor on Labor Day. =( It sort of makes sense to "labor" ON Labor Day, no? Our family has been celebrating the end of my mother's cancer treatments. However, mom has been battling an infection over the last week. Please pray with us for healing. My nearest Outback steakhouse caught on fire and closed (temporarily). =( Good thing there are a few other locations within driving distance. Don't miss the Manic Monday Minute. Get the feed [here]. Giving away 2 TICKETS to Catalyst One Day here tomorrow. Don't miss out! Someone told me about the book "the Energy Bus" the other day. Within minutes another person gave me a copy of the book. Shazzzzam! AG Leaders are mourning the death of a pastor who helped plant over 1,000 churches. That's 1,000. Wow. Trying to wrap my mind around that. 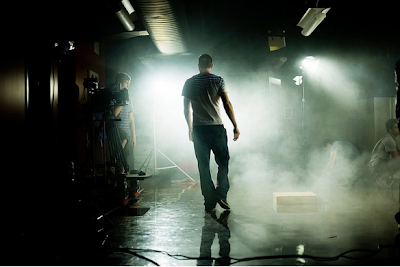 Very cool new project from Shaun King and celebrity Eva Longoria. I asked several students this weekend what was on their bucket list? the responses were very interesting... from "skydiving" to "i want to lead a country." I'm amazed at all the leaders who are night-owls (or maybe workaholics). I'm up emailing, chatting, etc. with some of them several nights a week. the Salted Caramel Hot Chocolate is back @ Starbucks. Hands down one of the best drinks you'll ever have there. Facebook getting a stalker button? Praying for students, faculty & staffers as they begin a new school year tomorrow. Thanks for spending a hot minute with me. 1 Comments Published by Terrace Crawford on 9/2/10 at 8:50 AM. Ran across this video (featuring Christian rapper Trip Lee) recently on TK McKamy's space and thought it was really cool. The treatment of the video was written around the concept of a year 2030 American culture where Christians are supposedly suppressed from society and tracked by a sub governmental company. I enjoy reading TK McKamy's blog too, because not only will you get to drink this incredible digital juice but you also get a behind the scenes look at his work. From photos to technical deets, its flat impressive. The Best Content on the Web! 6 Comments Published by Terrace Crawford on 9/1/10 at 4:44 PM. 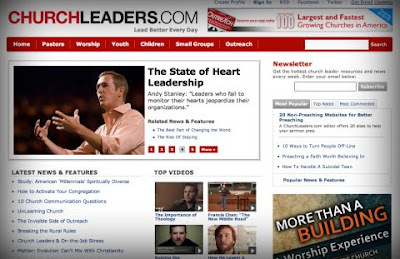 One of the things that led me to accept an editor's role at ChurchLeaders.com was the fact that I knew I would be able to help resource leaders and point them to the best content on the web. The problem is that I'm not capable of finding everything that is worthy of placement on our site... and that is where YOU come in. I would like your help in finding great content. If you run across a blog post, video, news article or how-to post that you feel might benefit other youth workers would you please send them my way? If we use what you send us we'll be sure to give you credit. If you haven't already, be sure to check out the site... and tell other church leaders where they can find the best content on the web. Go [here] for more info on how you can become a scout and contribute to ChurchLeaders.com.